ALWAYS review and follow the directions provided with your cylinder. The below instructions are a general overview. ENSURE you follow all safety precautions including wearing protective eyewear and gloves. Point gun into trash can or towards scrap material and depress trigger to test product flow and obtain proper pressure before dispensing. Modify product flow by closing the cylinder valve slightly, or by only partially depressing the gun trigger. Excessive pressure may cause product to splash off walls. 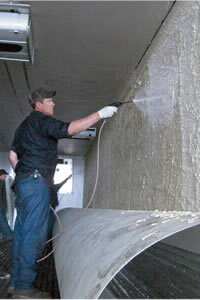 Apply Liner Bond, ensuring total coverage by spraying up to 1” thick. Place liner, adjust as needed. Shore up with plywood, 2’x4’s and load locks.